Advocate for OM Research during February! Join us in advocating for OM research this month as we lead up to Rare Disease Day. Held on the last day of February every year, this day is set aside to raise awareness amongst the general public and decision-makers about rare diseases and the impact on patients' lives. 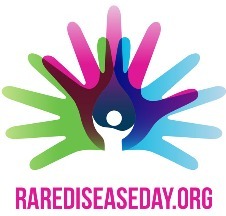 Wednesday marks the 11th Rare Disease Day. * Organize a Fundraiser in your community, church, neighborhood, school, or workplace. * Crunched for time? Start an online personal fundraiser using Crowdrise. * Donate to OMF. OMF is committed to supporting ground-breaking research. Your generous contribution helps us to sponsor annual grants for OM research. * Spread awareness by posting your story to Facebook, Instagram, and Twitter. 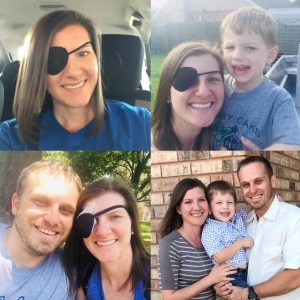 ​Meaghan's story: About two years ago, I started seeing purple spots and flashes of light out of the corner of my left eye. I was pregnant at the time, and initially, I assumed this might have been pregnancy related! I went to an optometrist who thought it was just fluid buildup; due to the pregnancy, I did not have my eyes dilated. I delivered a beautiful, healthy baby boy in December 2016. I gave it a few months, but the spots and flashes were still there. In February, my optometrist dilated my eyes, and saw a "large mass" on the back of my left eye. I was officially diagnosed with OM on March 2017. I opted for Proton Beam therapy with Dr. Roi Dagan at the UF Proton Institute. I am a 4th grade teacher, Gifted Education. My son is now one, and he is my life! My goal is to enjoy every minute of this precious life we have been given. Sometimes I almost feel grateful for this awful illness because it has allowed me to see the value in each day. Do you have a story to share? Send your story and picture to holly@ocularmelanoma.org. 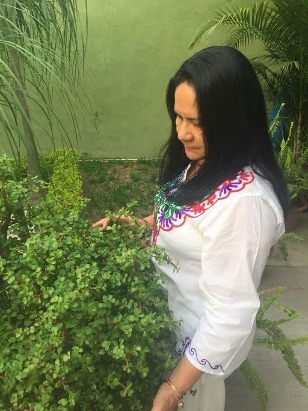 Soraya's Story: ​On March 21, 2017 based on my daughter´s insistence, I visited an ophthalmologist. I was about to turn 63 years old. My intent of the visit was to update my glasses graduation. I felt I was losing my right eye vision. I had also been experience some flashes and began to worry about a large brown spot that followed me wherever I turned. The doctor performed the exam, but something he saw something in my eye that I instantly noticed worried him. He asked me to return in the next 2 days (23rd day of the same month). He wanted to be sure of something he had seen in that eye. At the next appointment, the doctor dilated the pupil and definitely confirmed his suspicion. Unfortunately, it was what I feared, there was a "CHOROID MELANOMA." My doctor and my daughter were angels in my way: the doctor acted as quickly as the case required, and my daughter exercised concern and insistence that I visit the doctor. After several tests, I had a right eye enucleation. Since then, my life has changed in a certain way; but I managed to recover my confidence. I even returned to drive my truck. This huge step gave me even more security. I have returned to be a proactive and enterprising woman, as I have always liked to be. I have faith in God that this prompt diagnose will be able to ended this terrifying story, but I do not want to say goodbye without first sending a message to the whole world: There are many rare diseases, please when you feel that your body is not behaving as regularly or there is any sign that something is abnormal, please do not hesitate to go to your doctor and have yourself examined, then it may be too late. 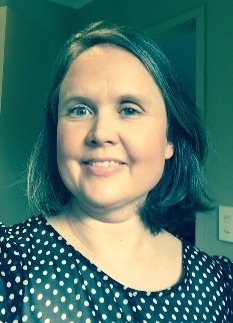 ​Heidi's story: I was diagnosed with a large Choroidal Melanoma on September 2016 at age 41. I had to decided very quickly about treatment. I chose enucleation and had the operation 4 days after diagnosis. Now I have a prosthesis. So far, there has been no spread of the disease. I live in New Zealand. Over here, there is a 5% chance of getting this OM. Heartbreaking! I have two fabulous kids, and I want to be here for them. My future is unknown and the scary part. 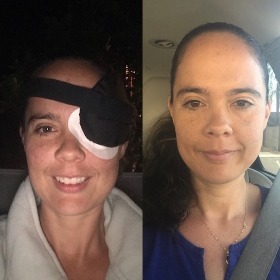 Pictures before surgery & after, with my prosthetic left eye. ​Do you have a story to share? Send your story and picture to holly@ocularmelanoma.org. 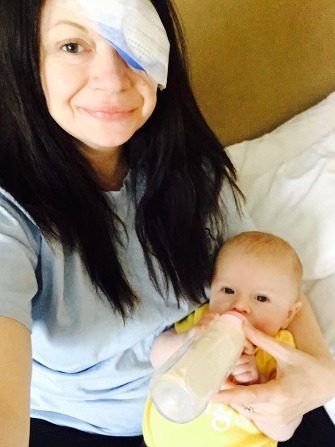 Katie's Story: ​On March 31, 2017 at the age of 32 I went to the eye doctor for the very first time with no symptoms in my affected eye. I actually went hoping I was a candidate for Botox to treat an annoying persistent twitch in the opposite eye that had been present for several weeks causing me a great deal of problems. God sends you signs in mysterious ways because that twitch probably saved my life, and the day after that appointment the twitch remained gone forever. That day I found out I had malignant choroidal melanoma, and my life changed forever for the better. I now live life with purpose, passion, hope, and my faith. I was set up with my amazing team in Memphis, TN shortly after and received plaque radiation. My tumor to date has shrunk 1.0 mm with no metastasis. I continue to be blessed and shortly after my first 3 month checkup found out we would be blessed with a second child. As my 1 year anniversary creeps up, I look back at this wild and crazy year and can’t help but feel grateful for the multiple blessings I’ve received from this cancer diagnosis. I never in my wildest dream thought I would have cancer, I had this foolish attitude that I was immune (silly me) so please take care of yourself and book a dilated eye exam! My hope is to spread awareness to rare diseases as well as preventive exams and screenings. 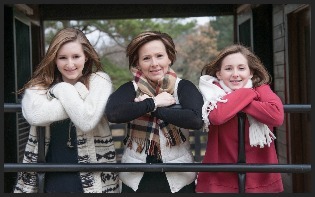 Jeanne's Story: ​I was diagnosed with ocular melanoma in August of 2008. My surgery to remove my left eye was 9/11/08 and I have been cancer free ever since. I first noticed a problem in July 2007 but thought I only needed bi-focals. I finally got new glasses in June of 2008, and they were just not right. I had trouble adjusting to the new glasses so I went back to my eye doctor who re-examnied me and said he could see a spot on the back of my left eye but did not know what it was. This was 8/12/08 and my appointment to see a specialist was 8/14/08. The specialist made the cancer diagnosis and sent me to the University of Iowa to see Dr Culver Boldt the day after Labor Day. Dr Boldt said the tumor was too large to save my eye and referred me to the eye surgeon, Dr Nerad who scheduled me for surgery on 9/11/08. This year I celebrate being 10 years cancer free. Being single vision has been an adjustment, but I am grateful for my doctors, nurses, hospital, ocularist and especially my family. My faith in God has helped me to adjust as well and I have taken this challenge to glorify God and encourage others. Dawn's Story: ​Writing this piece was one of the most vulnerable experiences of my life. 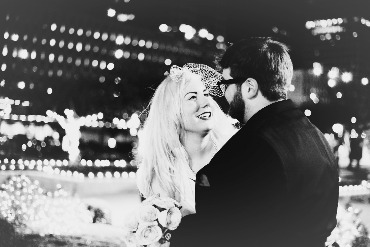 When I was first diagnosed with ocular melanoma in 2013 two months before our wedding, I told my husband, Alex, that I wanted to use this experience to help others. My hope in sharing this story is that it can provide some sense of hope, support, or inspiration to someone out there. There is a lot of stigma surrounding prosthetics of all kinds. Please share if you would like to join me in celebrating the miracle of prosthetics and how they can change lives. Additionally, I have been blessed with over four years of being cancer-free without any metastases, and I want to let people who may have recently been diagnosed with a rare disease that you should always have HOPE. My OM diagnosis sparked a fire in us to truly LIVE with intention, passion, exploration, and faith. A rare disease can bring new beginnings and new life. Do you have a story to share? Send story and picture to holly@ocularmelanoma.org. 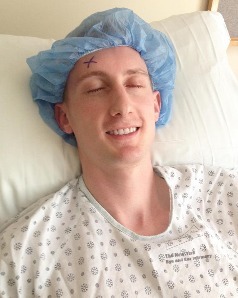 Shelby and Chris share this for Rare Disease Day: "​Chris is an Ocular Melanoma (OM) survivor. 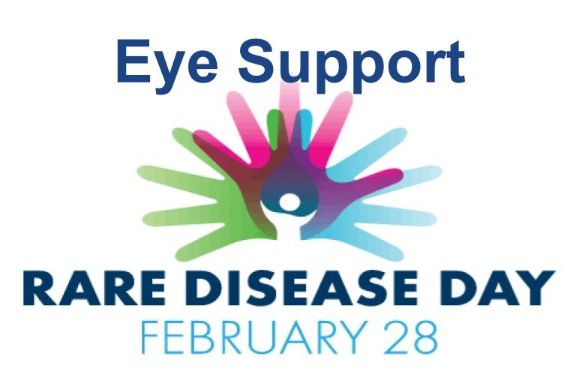 This rare eye cancer is diagnosed in around 2,000 adults every year in the United States and occurs most often in lightly pigmented individuals with a median age of 55 years. Chris was 30 when he was diagnosed in July of 2014. These tumors can grow and spread from the eye to other parts of the body – this process, known as metastasis, is most often fatal and occurs in about 50% of all cases. Currently there is no standard adjuvant treatment to prevent metastasis and no effective therapy in the metastatic setting." They are currently advocating for OM research. Do you have a story to share? 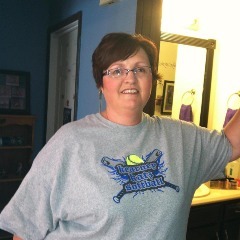 Send your picture and story to holly@ocularmelanoma.org. ​My name is Serina. I’m a wife and mother to 3 children. I was diagnosed with OM last March. My tumor was discovered during a routine eye exam and I didn’t have any major symptoms. In April, I underwent brachytherapy treatment for 7 days. Since then, I undergo routine bi-annual scans and feel blessed to be under the care of a great medical team of doctors and specialists. I tell all my close family and friends to get their yearly dilated eye exams as part of their routine of overall health and wellness. Early detection is so important and knowledge is power! We are in charge of our own health, if we don’t take care of ourselves, no one else will. ​Do you have a story to share? Send your story with a picture to holly@ocularmelanoma.org. ​My name is Josey, and I was diagnosed with uveal/ciliary melanoma on January 2016 during an eye exam after I started experiencing flashes and veils in my right eye. A week later I was sent from Georgia, where I live, to Wills Hospital in Philadelphia where Dr. Carol Shields performed Radioactive Plaque Therapy, Laser Photocoagulation, and Anti-VEGF therapy. I go for X-rays, MRIs and Scans every six months and have Avastin shots every three months. I am a single mom of two amazing daughters who, with my family and friends, are a great support and my motivation to keep fighting this beast. As a result of my diagnosis in 2016, I left 15+ years of early childhood education and began working for the eye doctor who first diagnosed me. 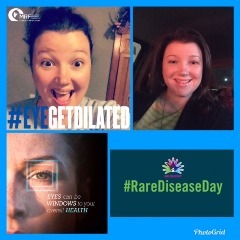 My passion now is to bring awareness to this rare diseases and urge everyone to get yearly dilated/retinal imaging exams. Do you have a story to share? 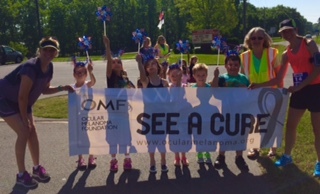 Send your story with a picture to holly@ocularmelanoma.org. Use the following link to fill out a Warrior Worksheet which can help you plan a fundraiser/awareness event. Please email info@ocularmelanoma.org if you have any questions.